The design of well-lit environments requires an understanding of the function and capabilities of the visual system, insight into visual perception, knowledge of the basic properties of light, and other factors such as health issues (CIE, 2004a-b, LRC, 2003). These include knowledge of our visual system about adaptation (the eye’s adjustments to ambient light levels), spectral (colour) characteristics, composition of diffuse and direct light, brightness contrast or luminance gradient and more. They also include knowledge of our circadian (non-visual) system about factors such as appropriate light signals during the day and darkness at night (to maintain circadian rhythms), the intensity of light and the time of day when it is applied, as well as its spectral characteristics. We have traditionally concentrated our design work on creating lighting conditions that are suitable for the visual tasks performed in a room and that simultaneously meet individual needs. Attention needs to be given to both our central vision (illumination of an object) and our peripheral vision (illumination of the surroundings). Peripheral vision contributes to an impression of the surroundings in which we find ourselves – space dimensions and shape, ambience, materials and light distribution. In the design phases this is supported by appropriate placement and sizing of windows to achieve an intelligent balance between the intensity of light, its location and direction. The light in a room should neither restrain nor impede our ability to see, thus allowing us, at all times, easily to orientate ourselves and move freely around in the rooms and the building. If the lighting of a space is unsuitable or inadequate, and makes it difficult to see properly, it will influence our performance (the visual system), as well as affect our health (the circadian system) and personal well-being (the perceptual system). It can result in unnecessary eye strain and give rise to symptoms such as eye irritation, fatigue and headache. Lighting conditions that can cause these symptoms are poor brightness and contrast, high luminance differences and flickering. A good daylighting design will provide large amounts of glare-free light; a poor daylighting design, on the other hand, will provide either inadequate amounts of light - so that electric lighting has to be used frequently - or large amounts of light, together with glare (Boyce et al., 2003). Furthermore, our daily life consists of changing visual tasks, with similarly changing demands on the lighting provided. The light variation within our field of view can influence visual comfort and performance. For good visibility, some degree of uniformity of light is desirable. Poor visibility and visual discomfort, such as glare, may occur if the eye is forced to adapt too quickly to a wide range of light levels. Too high or too low contrast can also result in tiredness, headaches and discomfort. Although there are no specific guidelines for dwellings, it is believed that luminance variations of around 10:1 are suitable for daylighting design. Generally speaking, the human eye can accept greater luminance variations when spaces are lit by daylight than when they are artificially lit. The sensation of glare can occur when luminance variations exceed 20:1 to 40:1 (Rea, 2000). In the event of glare, the eye adapts to the high level of the glare source, which makes it hard to perceive details in the now too-dark work area. Glare from daylight may be caused by several potential sources such as the sun, bright sky and clouds, and surfaces reflecting the sun. •	Disability glare – the effect of scattered light in the eye whereby visibility and visual performance are reduced. This occurs when glare sources of high luminance (e.g. sun or specular reflection of the sun) are in the field of view. In daylit interiors, it is often found that discomfort glare is reported before disability glare becomes an issue. •	Discomfort glare – defined as an irritating or distracting, but not necessarily impairing, effect. So in most cases, the perceived magnitude of discomfort glare is lower than for disability glare. Discomfort glare indoors is influenced by the full visual environment, including windows, reflections (especially specular), external surroundings and/or interior surfaces. Discomfort glare may cause later side- or after effects in the form of headaches or fatigue. •	Reflections or veiling glare – reflections on display screens or other task materials (e.g. paper) reduce the contrast between background and foreground for the visual task and thus reduce readability. Reflections occur when bright light sources (e.g. windows) are in the reflected field of view of the screen. To reduce the occurrence of glare, shading devices should be employed. Figure 1.3.1 below shows a situation where glare is controlled by external solar shading (awning blind). Shading devices such as Venetian blinds, awnings, vertical blinds and roller blinds are suitable for this purpose, but the specific material characteristics should be taken into consideration. Figure 1.3.1 Luminance map of a task area showing sun patches causing glare (left), Luminance map of task area showing glare control with external solar shading (right). A movable or retractable device can be individually adjusted, while fixed devices may need additional shading devices to support individual requirements for glare protection. Windows located in more than one orientation, or in the roof, could adequately maintain daylight illumination for the visual tasks and provide a view to the outside, rather than being shaded to control potential glare sources. The primary target in the daylighting of buildings has generally been to provide adequate light levels in the room and on the work plane, so that daylight is the main, or only, source of light (autonomous) during daytime. Several metrics address daylight availability for a task and/or a space, and an important aspect of daylight is to understand that it is variable: it varies with the seasons of the year, the time of day, and the weather. For this reason, metrics for daylight availability calculations are often based on relative rather than absolute values. This is usually defined in terms of the relationship between the light available at different positions inside with that available outside (e.g. the daylight factor, DF). The absolute levels of illuminance that are needed for a particular visual task will depend on the character of the task and the visual environment where it is performed. As an example, the Chartered Institution of Building Services Engineers, CIBSE (CIBSE, 2006), recommends the following light levels. See section 1.7.1. •	100 lux for interiors where visual task is movement and casual seeing without perception of detail. •	300 lux for interiors where visual tasks are moderately easy. •	500 lux for interiors where visual tasks are moderately difficult and colour judgment may be required, e.g. general offices, kitchens. •	1 000 lux for interiors where visual tasks are very difficult, requiring small details to be perceived. Requirements for daylighting have yet to be defined in terms of specific illuminance levels, but there is enough evidence in literature to indicate that illuminances in the range of 100 to 3 000 lux are likely to result in significant reduction of electric lighting usage (Mardaljevic, 2008). Meeting the need for contact with the outside living environment is an important psychological aspect linked to daylighting (Robbins, 1986). The provision of daylight alone is not enough to satisfy user desires for views. Windows provide contact with the outside, supply information of orientation, give experience of weather changes and allow us to follow the passage of time over the day. A view that includes layers of sky, city or landscape, and ground (Boyce et al., 2003), could counteract tiring monotony and help relieve the feeling of being closed in. The size and position of window systems need to be considered carefully in relation to the eye level of the building occupants. Daylight has a wide range of influences on humans that go far beyond our need for vision. We often refer to this as the non-visual effects of light. When we speak about health, balance and physiological regulation, we are referring to the functions of the body’s major health keepers: the nervous system and the endocrine system. These major control centres of the body are directly stimulated and regulated by light (Edwards and Torcellini, 2002) by a specific subtype of retinal ganglion cells – ipRGCs - intrinsically photosensitive retinal ganglion cells. Together with our visual system, these ganglion cells in the eye are sensitive to light. Daylight should provide enough light in the room and on the work plane to be the main, or only, source of light during daytime. Occupants can accept greater luminance variations in spaces lit by daylight than if artificially lit. Luminance variations of around 10:1 are suitable for daylighting design. The sensation of glare can occur when luminance variations exceed 20:1 to 40:1. Many aspects of human physiology and behaviour are dominated by 24-hour rhythms that have a major impact on our health and well-being. They control sleep/wake cycles, alertness and performance patterns, core body temperature rhythms, as well as the production of the hormones melatonin and cortisol (Pechacek et al., 2008). These daily rhythms are called circadian rhythms and their regulation depends very much on the environment we live in. The dynamic variation of light, both daily and seasonally, is a critical factor in setting and maintaining our 24-hour daily rhythms – our circadian rhythms – which, in-turn, play a key role in the regulation of the sleep/wake cycle. Sleep disruption has been linked to poor cognitive function, stress, depression, poor social interaction, metabolic and cardiovascular disease, increased susceptibility to infection - and even cancer. An appropriate light signal during the day and darkness at night are therefore critical in maintaining key aspects of our overall health (Circadian House, 2013). Figure 1.3.2 Production of the hormones melatonin and cortisol (Brainard, 2002). For example, in order to align our body clock, morning light is the most important signal for entrainment. Light in the morning also increases our levels of alertness, allowing increased performance at the beginning of the day. Whereas reduced light levels in the evening promote sleep at night. There are other external time markers but daylight’s characteristic light/dark variation, continuity and spectral composition are excellent synchronisers of our circadian rhythm. It is now evident that daylight is not just a stimulus for vision, but acts as a key element in the regulation of many areas of human health. 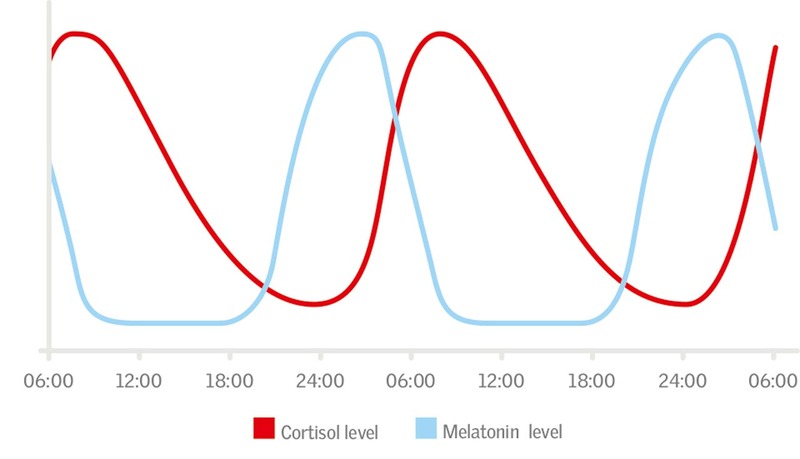 Figure 1.3.2 shows the production rhythms of the hormones melatonin and cortisol. How our biology responds to light intensity, duration, timing, and spectrum is highly complex and varies greatly between our visual and circadian systems. All these characteristics are used as a first step towards prescriptions of healthy lighting in buildings (Veitch, 2002). Inadequate light exposure can disrupt normal circadian rhythms and have a negative effect on human performance, alertness, health and safety. We know that outdoor daily light exposure allows us to regulate our sleep/wake timing and levels of alertness. But the reality is that we spend we spend 90% of our time indoors (Klepeis, 2001; Leech, 2002; Schweizer, 2007), where we are exposed to relatively low light levels of a limited spectral range, and where the patterns of light and darkness occur at irregular intervals. Preliminary evidence suggests that low light exposure is associated with diminished health and well-being and can lead to reduced sleep quality, depressed mood, lack of energy and impaired social relations. Most people are able to read and work with a daily light level of 500 lux, but one hour’s exposure to 500 lux may not be enough to trigger the circadian rhythm (intensity). In a study by Mardaljevic et al. (2012), a case with and without roof windows is investigated to determine the effect of light intensity. The case with only facade windows shows that the degree of light intensity is greatest for those viewpoints/directions located closest to and directed towards the window. The case with roof windows shows a greater intensity for all locations in the room, and with less of a preference for those views directed towards the window. This illustrate the importance of using daylight as a key source of light required for effective suppression of melatonin, since the magnitude needed could be of the order of 1 000 lux depending on the spectrum. As another example, a study conducted in San Diego during a temperate and sunny period showed that, when awake, the average person spent 4% of each 24 hours in illumination greater than 1 000 lx (on average 130 min), and more than 50% of the time in illuminance levels from 0.1 to 100 lx (Espiritu et al., 1994); the people with the shortest daily exposure time to high light levels (above 1 000 lx) reported the lowest mood. Other light exposure investigations show a similar trend. We know daylighting can provide much higher levels of illumination than electric lighting, and can help significantly to increase the light dose received by people spending most of their time indoors. 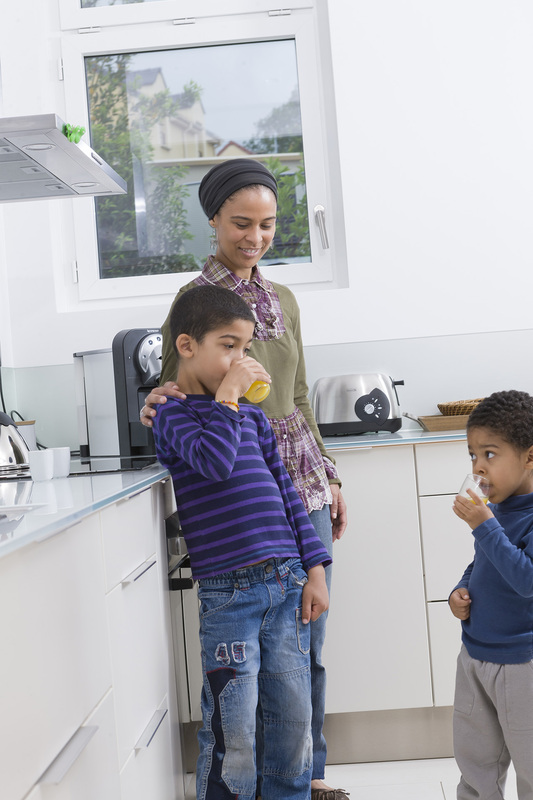 In support of this, a large Finnish epidemiological study found that health-related quality of life was higher for people reporting higher interior light levels (Grimaldi et al., 2008). The visual system reacts to and processes light impulses in a fraction of a second, whilst the biological clock needs minutes or hours (duration). This means that both the illuminance at the eye and the duration of exposure are important to the effect of light on our circadian system. The time of day at which light is registered on the retina also has a clearly different effect on the visual system and circadian rhythm (timing). Exposure to intense light in the morning can reset the biological clock to an earlier time (“get up earlier”), whilst in the evening, it sets it to a later time (“get up later”). This is, in essence, the syndrome of jetlag, caused by a conflict between the biological time of day and the geographical time of day. The visual system reacts identically whatever the time of day. Specific requirements for different age groups also need to be taken into account. Adolescent and young adults have a somewhat delayed biological clock and need more light in the morning (bedroom, breakfast room, classroom, etc. ), whereas older people have a biological clock that has shifted earlier (often resulting in falling asleep in the evening and waking up early in the morning) (Wirz-Justice and Fournier, 2010). Daylight is recognised as having the highest levels of light needed for the biological functions (Hathaway et al., 1992) compared with typical electric light sources. The light that is important to our circadian rhythm (C(λ)) is different from the light that is important to our visual system (V(λ)) because of the spectral difference in the light sensitivity of the individual photoreceptors (spectrum). 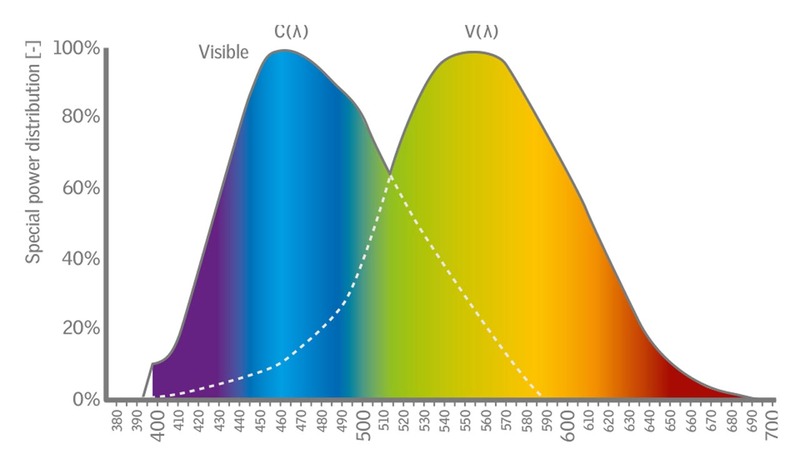 The circadian system (C(λ)) is most affected by the wavelength region 446 to 488 nm, whereas the visual system (V(λ)) is most affected by the wavelength around 555 nm, as shown in figure 1.3.3. Figures 1.1.1 and 1.1.2 presented earlier show that the spectral composition of daylight is much richer in these regions of the electromagnetic spectrum than typical electric light sources. ​Figure 1.3.3 Circadian (C(λ)) and visual (V(λ)) systems' response to light (Pechacek et al., 200​8). People in modern societies do not receive enough light on a daily basis and need to be exposed to higher levels of illumination for longer durations. We need a daily daylight exposure, because daylight is rich in the spectrum to which the non-visual system is most sensitive. Healthy light is linked to healthy darkness. CIBSE (2006) Guide A: Environmental design. Chartered Institute of Building Services Engineers, London. CIE (2004a) Ocular lighting effects on human physiology and behaviour, (No. CIE 158:2004) Vienna, Austria: Commission Internationale de l'Eclairage. Circadian House report (2013) Circadian House - Principles and Guidelines for Healthy Homes. VELUX report http://thedaylightsite.com/library-3/research-publications/papers/ ((accessed: 2014-12-10). Edwards, L., Torcellini, P. (2002) A Literature Review of the Effects of Natural Light on Building Occupants, National Renewable Energy Laboratory, U.S. Department of Energy. Espiritu, R. C., Kripke, D. F., Ancoli-Israel, S., Mowen, M. A., Mason, W. J., Fell, R. L. et al. (1994) Low illumination experienced by San Diego adults: Association with atypical depressive symptoms. Biological Psychiatry, 35(6), 403-407. Grimaldi, S., Partonen, T., Saarni, S. I., Aromaa, A., and Lönnqvist, J. (2008) Indoors illumination and seasonal changes in mood and behavior are associated with the health-related quality of life. Health and Quality of Life Outcomes, 6, 56. doi: 10.1186/1477-7525-6-56. Klepeis, N. E., Nelson, W. C., Ott, W. R., Robinson, J. P., Tsang, A. M., Switzer, P., Behar, J. V., Hern, S. C., Engelmann, W. H. (2001) The National Human Activity Pattern Survey (NHAPS): A resource for assessing exposure to environmental pollutants. Journal of Exposure Analysis and Environmental Epidemiology, 11(3), 231-252. Leech, J. A., Nelson, W. C., Burnett, R. T., Aaron, S., Raizenne, M. E. (2002) It's about time: A comparison of Canadian and American time-activity patterns. Journal of Exposure Analysis and Environmental Epidemiology, 12(6), 427-432. Mardaljevic, J., Andersen, M., Roy, N., Christoffersen, J. (2012) Daylighting, Artificial Lighting and Non-Visual Effects Study for a Residential Building. Pechacek, C. S., Andersen, M., Lockley, S. W. (2008) Preliminary method for prospective analysis of the circadian efficacy of (day)light with applications to healthcare architecture. Leukos, 5(1), 1-26). Rea, M.S. (2000) The IESNA Lighting Handbook: Reference and application, New York: Illuminating Engineering Society of North America. Schweizer, C., Edwards, R. D., Bayer-Oglesby, L., Gauderman, W. J., Ilacqua, V., Jantunen, M. J., Lai, H. K., Nieuwenhuijsen, M., Künzli, M. (2007) Indoor time microenvironment-activity patterns in seven regions of Europe. Journal of Exposure Science and Environmental Epidemiology, 17(2), 170-181. Veitch, J. A. (2002) Principles of Healthy Lighting: Highlights of CIE TC 6-11 ‘ s, National Research Council Canada. Wirz-Justice, A., Fournier, C. (2010) Light, Health and Wellbeing: Implications from chronobiology for architectural design, World Health Design, vol. 3.